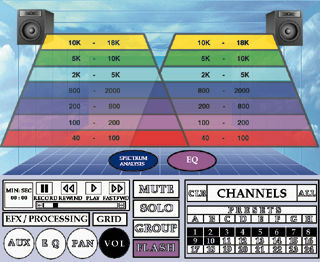 The Spectrum Analyzer shows all the frequencies of each sound spread in stereo. The volume of each frequency is a function of brightness and density — therefore, when two sounds overlap in the same frequency range it will appear darker in that frequency range. You can then tell if a band’s arrangement is bad — such as too many guitars or keyboards in the midrange hiding the vocals. You can say to the band that it isn’t your fault that the mix is bad. With the EQ, you can turn up the volume of a frequency by putting your finger on (or clicking on) the right side of the frequency band. Click on the left side to turn the frequency’s volume down. As you turn the volume up, the frequency band gets brighter. As you turn it down it gets dimmer. You can also reconfigure the bandwidth of each frequency band, making it narrower or wider. The way that the EQ functions (number of bands, bandwidth settings, etc.) is based on the actual EQ that you are controlling in software or hardware.